I recently built my ultimate dirt bike trailer and want to share the results with you. I will note that my use of the word “ultimate” means it’s the best trailer for me and my situation. If I were building with no budget or no special constraints on the size of the trailer I could use, I may have gone about the project differently. I chose an enclosed trailer to hold my dirt bikes. The benefit of an enclosed trailer is that you can load up the bikes into the trailer after you’re done riding, drive home, and then just leave the bikes in the trailer. No need to unload when you’re home like if they were in an open trailer or in the back of your truck. I just leave my trailer beside the house and I’m done. The bikes are protected from the elements and I can leave them in the trailer year-round. Under normal conditions, I would have chosen a larger trailer than a 6’x12’, but I store my dirt bike trailer on the side of my house and I live in a neighborhood, so I didn’t want a huge monstrosity of a trailer. I got the smallest trailer that could do the job. Also, I didn’t get the extra 6” of height in my trailer, because I wanted it to sit low in case I wanted to bring the dirt bike trailer into my garage, and also to make it sit lower behind the fence so it wouldn’t bug the neighbors. I recommend buying a trailer used. If you hunt trailers on Craigslist for a few months, you can often find them for great deals. I saw some as much as $1,000 cheaper than new for a trailer that was only one or two years old. That’s a lot of savings that you can put towards cool stuff in the trailer. I chose a single-axle trailer because I wanted something small and light, it’s more than enough to handle my dirt bikes. However, the problem with single-axle is that they tip when you put too much weight at the back and the trailer isn’t secured to the truck. So a double axle trailer would be nice, but that also means you have to buy four tires instead of just 2 each time they wear down. I obviously chose one with a ramp door on the back since I’m using it for dirt bikes. I used Racedeck floor tiles for the flooring in my dirt bike trailer. I did my entire garage in floor tiles and I really love it, so I used the excess matching tiles to do my dirt bike trailer. I’m a sucker for things that match, so having the same flooring in my garage as the dirt bike trailer makes me happy for some reason. Installing flooring tiles is a fun project because you can do the entire thing in one hour. You simply snap the tiles together all throughout the trailer and they lock in place permanently. The only tricky part is where the trailer is too wide or skinny for the last set of tiles around the edges. For this, you just take a table saw or a chop saw and cut those plastic tiles to the right size, then snap them in. I was completely done in one hour, and it makes a huge difference in the “cool factor” of your trailer. I was concerned initially about how to clean the floor with the tiles on. Fortunately, I found it’s quite easy. Dirt falls right between the ridges on the tiles. Then you just get out your blower and blow anything out. There are channels on the underneath side of the tiles so sediment can easily pass through. The cheapest option for making a nice looking trailer without going crazy with flooring tiles like I did, is to simply use textured deck paint as I’ll discuss for the walls below. Using this textured deck paint will likely give your trailer an extra 5 years of longevity, it looks nice, and prevents splinters. The most likely way your trailer will eventually get ruined after 10-20 years is water intrusion getting in the wood flooring boards and rotting it out. Once that happens, the trailer is dead. So if you quick slap a coat of deck paint on your trailer walls and floor as soon as you get it, your trailer is protected for many many years. I was too anxious to get my trailer done, so I didn’t take the time to paint the floor before installing the flooring tiles. I wish I would have slapped on a coat of paint first. The flooring tiles protect the flooring somewhat, but not from water. Painting the walls is mostly just for aesthetics, but I wanted my trailer to look nice inside, and also to keep it from getting ruined over time. I decided to use two colors of deck paint. I chose a very light gray for most of the trailer, and then a very dark gray for the bottom half of the walls. I did this so that the tires wouldn’t scuff up the trailer on the bottom where they sometimes rub, and then light on the top so it wouldn’t feel too dark and cramped in the trailer. You can find textured deck paint at Home Depot or Lowes. I paid $30/gallon. They had several options in terms of how much texturing you want. I chose the one that is one level down from the most textured (I forget what they call it). The reason I chose this level is that the lady at the paint desk said the most textured option can sometimes flake off after time. I got 3 gallons of paint to cover my 6×12 trailer’s walls and floor and the ramp door on the back. It was enough, but just barely. 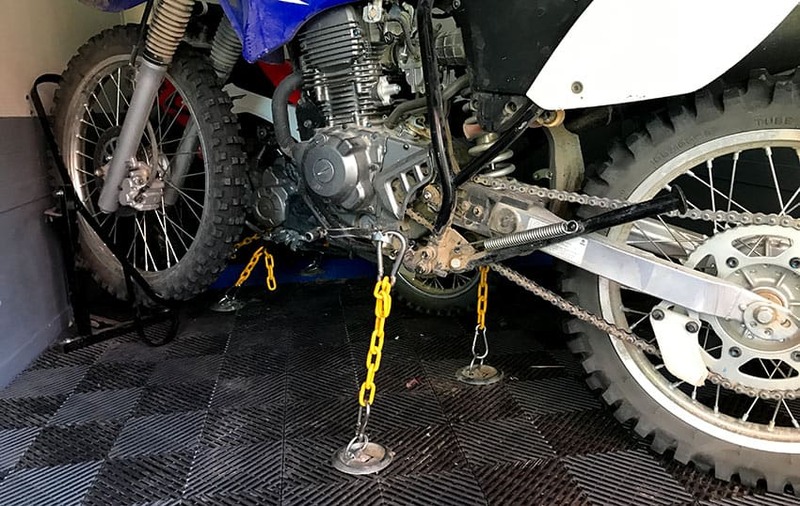 I have covered this in another post on the best wheel chocks for dirt bikes and also how to secure a dirt bike without straps, but here’s the quick breakdown of how I secure the dirt bikes in my trailer. 1. I bought these dirt bike wheel chocks for the front tire. They are excellent and not too expensive. 2. Put the bikes in at a diagonal so the front tire contacts the wall, and the back tire contacts the wall. This increases stability dramatically. 3. I hate using straps because they compress the suspension and are a pain to work with, so I put d-rings on the floor under the foot pegs of the bikes, and attach a chain with a carabiner to the footpegs. This makes for an extremely secure system in conjunction with the wheel chocks. This method of securing the bikes is actually the part I like best about my dirt bike trailer. It’s so nice to be able to confidently secure the bikes in seconds, not mess up the suspension on my bikes, and to be able to do it all in under 30 seconds per bike. Awesome! This is a 6×12′ enclosed trailer for dirt bikes. I debated for a long time how I wanted to store the dirt bike protective gear in the trailer. At first, I imagined shelving in there to hold all our helmets in one spot, then cubbies where each person in the family could dump their other gear. While I think this would have worked just fine, I decided to go another direction and it’s worked out better for us. The reason I didn’t want to put shelving in there for the gear is that it would mean me, my wife, and my two boys crawling all over each other in the trailer trying to get our gear. Instead, we just bought inexpensive duffle bags on Amazon for storing our dirt bike gear, and we just set them in the trailer next to the side man door. 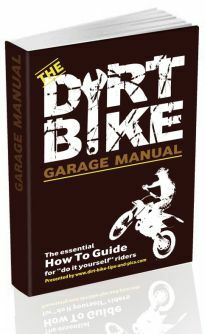 Then, when we pull up to the trail to start dirt biking, everyone can go to the side of the trailer to the man door and just pull out their duffle bag and start getting dressed while I open the back ramp door and pull out the dirt bikes. We like doing it this way because it’s fast, and also so that all our gear is in one bag. Then when we are going camping and we bring the toy hauler, we just grab our one duffle back and put it in the camper. Boom! At first, I wanted to set up the dirt bike trailer as a mechanic’s trailer so we’d have power outlets and a tool chest in there for doing quick repairs. In the end, I decided not to do this because it just increased the complexity of the project so much. I eventually decided to just get a good pump that can run on a cigarette lighter’s power so I can plug it into the truck. Then I just have a simple small tool bag of the most commonly used tools for fixing dirt bikes on the go. It’d be really cool to fully build out power and a tool area, but I decided it wasn’t worth the extra work for me. I usually don’t do major work on the bikes in the trailer anyway. I usually save that for when I’m home and can wheel them into the garage.